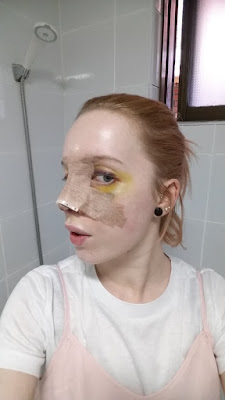 Selfie, Before after photos, and review after the surgery at id. Emily's REAL REVIEW after RHINOPLASTY! My stress free surgery day did not start well. Up all night fretting about the morning, taking early morning messages from friends back home followed by being stuck in awful traffic and running late for the appointment does not make for a calm and collected Emily. I ran into the lobby 10 minutes late and was greeted by Su, my translator, who whisked me away to pay and get ready for surgery. From then on out everything was much smoother and well organised. After paying, I was taken to meet my consultant and Dr Kim to go over some paperwork and 'design' my new nose. The consultant spoke to me, leaving time for Su to translate in-between and made sure I understood everything before I signed. Dr Kim then came in to go over my photos with me and re-discuss what he would do to my nose and the effect it would have. After being assured I was happy with everything, Dr Kim drew the guide marks on my nose and checked I had no last minute questions. Then it was time to go down and get changed for surgery. I washed my face with a foam cleanser and was given a mouthwash to gargle with before being led to the locker room. My clothes, shoes, jewellery and coat were locked safely away in my own locker and I was given an adorable pajama style clothes to wear. A final wave goodbye and I headed into a small, clean theatre with two members of staff, “hold out your arm and make a fist 10 times then hold it”. Let go, count to 10, surgery time. I woke up in the recovery room, in no pain but very thirsty. I wasn’t allowed to drink but one of the staff let me swill water around my mouth. Su came by to pick me up after a while and took me to my locker, where I changed back into my own clothes. I felt a little tired and dizzy, but ok considering I had just had surgery. Su helped me down to the Lobby to meet my sister, then took us to the pharmacy to help me get all the supplies I needed. Back at home, I felt fine. Minor discomfort, no visible bruising yet, a lot of bleeding out my nose and a little dizzy, but functioning well enough. By 5.30pm the pain had kicked in. I was very uncomfortable and bled through a whole pack of the nose pads I had been given at the hospital. I slept very little the first night. As you can see the swelling and bruising made its debut today. I woke up to very swollen cheeks and eyes, and minor bruising around my eyelids, forehead, cheeks and nose. The swelling spread all the way down to my jawline, making it sore to move or touch, as well as limiting my mouth movements so I’m struggling to talk or smile. I can feel pain all the way into the bones in my face and teeth, in a continuous ache, but at least the bleeding has slowed down from my nose. It feels like having a very bad head cold, when I lean forward or move to fast, I get pressure pain in my nose and forehead. Eating is very painful and difficult because of the nose packing and stitches, but I have mastered drinking! WOOHOO! Go me! I can’t use a straw as the motion pulls the stitches, but tipping water into my mouth seems to work very well. Brushing me teeth was a big worry of mine, but I successfully managed it without accidentally suffocating or hurting myself. Drowsiness is a big problem for me today, as every time I sit down for too long I fall asleep. I have been obsessively staring at my nose while changing the nose pads and from what I can see I love it already! The tip looks so small and cute and the septum area doesn’t stick out any more. I am very excited about having the cast off. So. Much. Pain.. Mornings seem to be the worst for me, when I feel the most amount of discomfort and pain. By 9am I decided to try and eat, managing to finish a banana in a record of 40 minutes! The bruising around my eyes is impressively obvious now, the top half of my eyelids deep red and black, while under my eyes is yellow, green and brown. I have light bruising up my forehead still and the swelling is far more obvious around my eyes and cheeks. 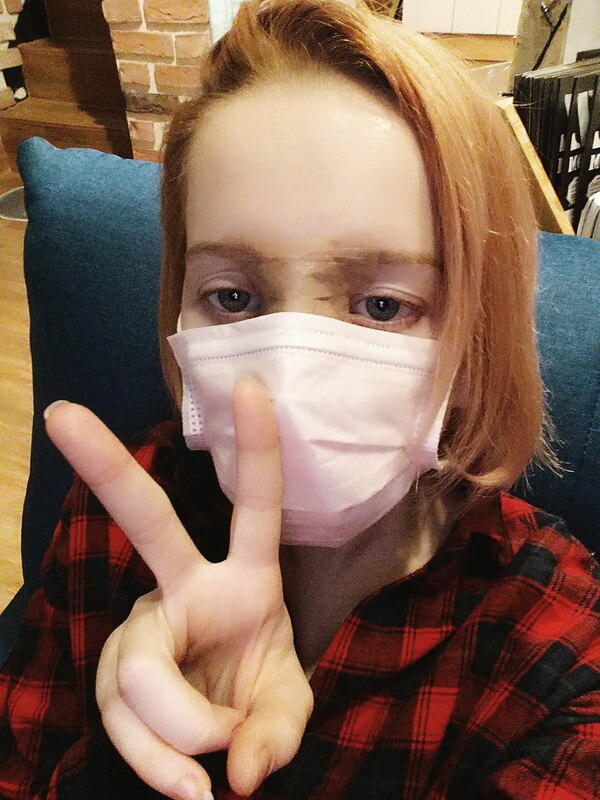 Today I have my nose packing removed back at ID Hospital and look forward to being able to breathe again. Having nose packing removed hurts. Alot. I made it to ID Hospital with only one dizzy spell (go me!) and was met by Su again, who led me to the treatment rooms. The nurse started by giving me an antibiotic injection into my bottom cheek to keep me healthy, then proceeded to get started on removing the nose packing. Her cool, calm manner did nothing to help the pain I felt. The only redeeming feature was that the process was over and done with very quickly, and that I could breathe properly again. She then checked on my stitches in my ear and, through Su, informed me that I was not to wash my hair yet and that I would have my stitches out on Monday. By the time I got home, the pain had gone down and I could truly appreciate how much better I felt without the packing in my nose. Although my nose runs continuously, I felt well enough to try and eat out with a friend and just being able to breathe made me feel so much happier. As expected, when I move too much, like talking to enthusiastically or opening my mouth too wide or smiling, I set off minor nosebleeds and a little bit of pain. I CAN BREATHE! AND I SLEPT THE NIGHT THROUGH! 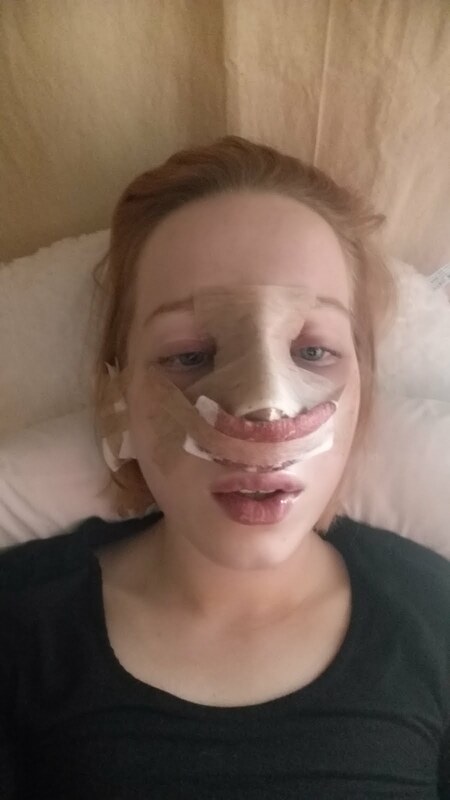 Having the nose packing removed has improved my recovery in leaps and bounds. I woke up feeling a little bit rough with a blocked nose and a little bit of pain but got up, took my medication and ate breakfast. After that I felt fine all day. The bruising around my eyes is darker on the eyelids and very bright yellow under my eyes. The swelling is still quite obvious around my eyes and cheeks and still quite sore to touch, but seems to be going down slowly. 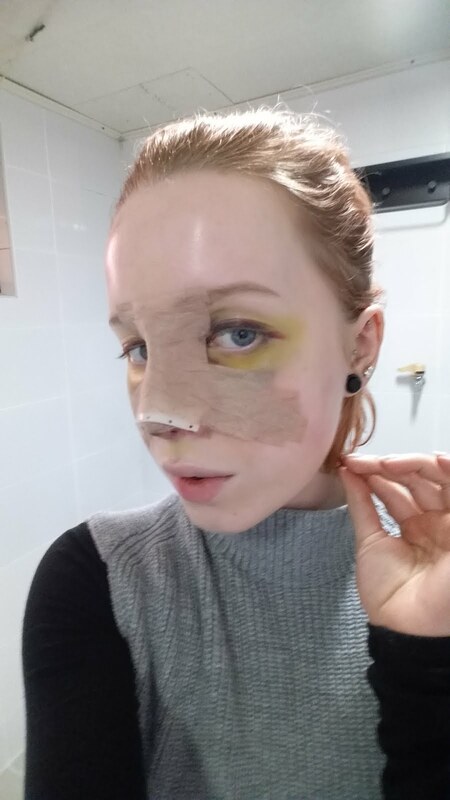 Where the tape from the cast sticks to the inner corners of my eyes and eyelids, I’m starting to get very sore and uncomfortable so I can’t wait to have it taken off. Counting down the days now. I spent all day being very active; baking cakes, drawing, making food, helping clean around the house and I felt fine. No dizziness or tiredness. I am still getting pain from my stitches when I move my mouth too much and a sort of fuzzy pain around the tip of my nose at random intervals during the day. Laughing is still painful, which is understandable yet inconvenient, but smiling is getting easier as long as I hold back and only give a little smile. Not being able to wash my hair, or my face, or do face packs is the hardest part! 4 days left until I can. I can do this. I can’t do this. I want to wash my hair! Dry shampoo just isn’t the same. On the plus side though, I slept 9 1/2 hrs last night and woke up with no pain, dizziness or blocked nose. The swelling around my eyes has gone down very well and they are only a little swollen now, but my lower left cheek is still quite swollen. The bruises on my lower lids are as vibrant as ever, although the ones on my upper eyelids seem to have faded slightly. My nose is continuously running still, but I’m not getting any blockages or heavy nosebleeds. The fuzzy pain around the tip of my nose has spread up the bridge of my nose, but still only comes at random intervals. I can smile with more ease now, and my appetite came back (yay! ), so I am actually eating regularly and decent amounts. I was very paranoid about going outside today, as the bruises are so obvious and I just feel unkept without being able to wash my hair etc. but I did anyway and no one gave me a second glance! 2 months after surgery and it still shocks me how different I feel about myself now. I am far more confident with how I look and will happily have photos taken of me from the side. 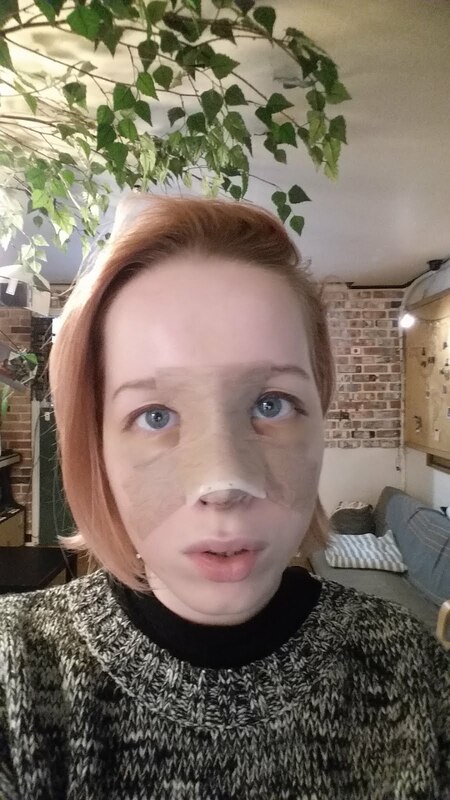 The swelling is still going down, slowly but not evenly, so my nose looks ever so slightly wonky at the moment as one side is healing faster. I don't get pain in my nose anymore but for some reason I still get aches and shooting pains from my ear, where I had some cartilage removed for the surgery. What I have noticed though, and what is most important to me, is that at this stage of recovery I can start moving my face more naturally again. I am very enthusiastic when I speak and tend to basically use every muscle in my face during the course of a conversation. To begin with, the swelling made it quite uncomfortable to move much while talking or made the movements quite wooden. Now I have far more freedom to move and pull as many funny faces as I want! 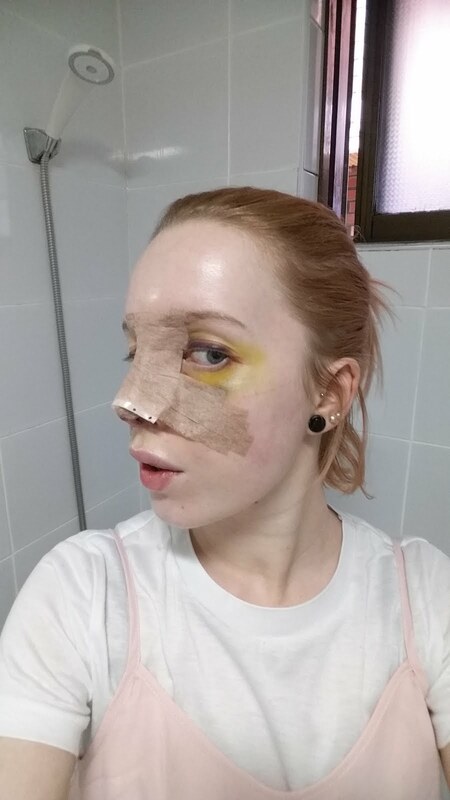 Due to to unforeseen circumstances, I had to take two long haul flights in the last few weeks and this has caused nosebleeds, soreness and some minor swelling to resurface, mostly in the tip of my nose. I am not too concerned on how this will affect my recovery, as long as I continue to follow the instructions of care given to me by Dr Kim and the nurses. I am very happy with how my nose looks now and how fast I recovered and can't wait to see how my nose continues to improve as the swelling goes down over the next few months. Read Emily's one year post-surgery interview here!